Nutella has stayed with me ever since, along with my other Euro-fave, Evian water. My sister Tina went overseas to school in Switzerland for two years and became likewise addicted to Nutella. It’s really quite bad for you since one of its main ingredients, responsible for that creamy mouthfeel, is palm oil. I don’t care; I love it. Now my son loves it, too. You can imagine his delight when I told him I was going to make a nutella version of the panna cotta; he was especially pleased when I told him the recipe made six ramekins instead of four! The recipe is the third panna cotta recipe from Nigella Lawson’s Nigellissima cookbook, and it’s even easier to make than the other two I’ve posted. 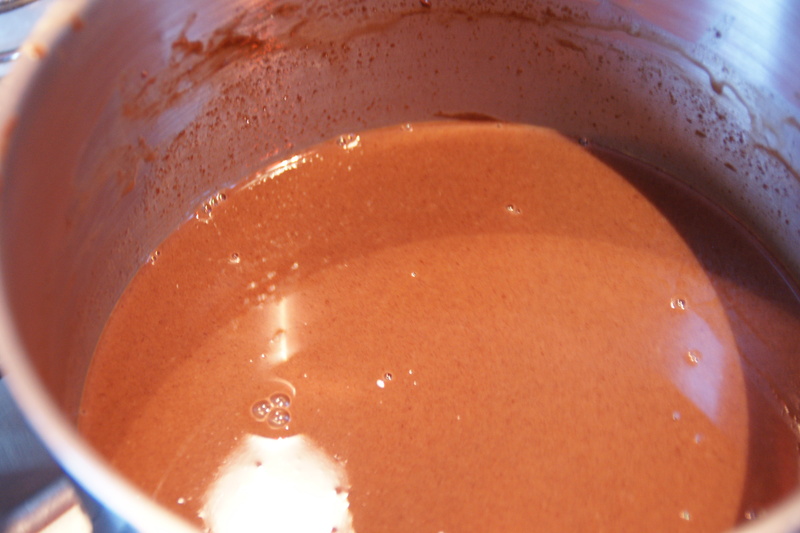 Cream, milk, nutella are heated, then softened gelatin mixed in until it dissolves. I added a pinch of salt and upped the gelatin from 1 tsp to 1 1/2 tsp, based on my previous experience with the coffee panna cotta. 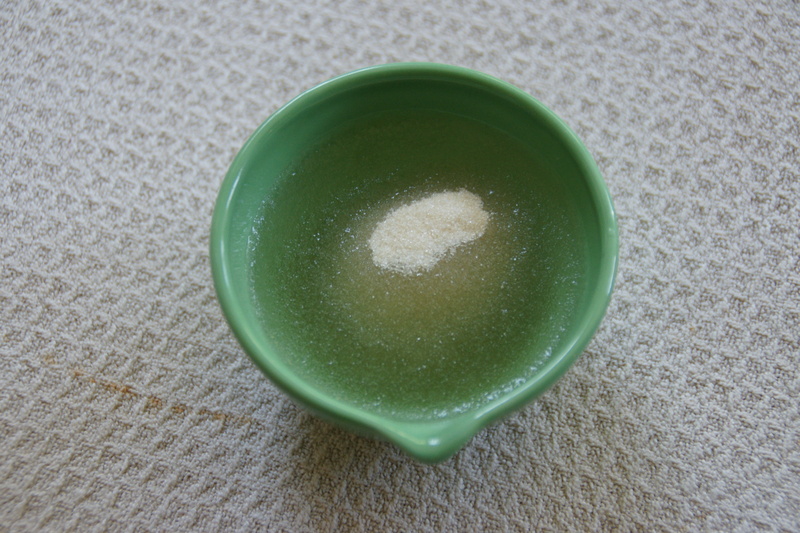 Place the water into a small bowl and sprinkle the gelatin over the surface. Let sit 10 minutes. Do not stir the gelatin; it will soften and absorb the water as it sits. 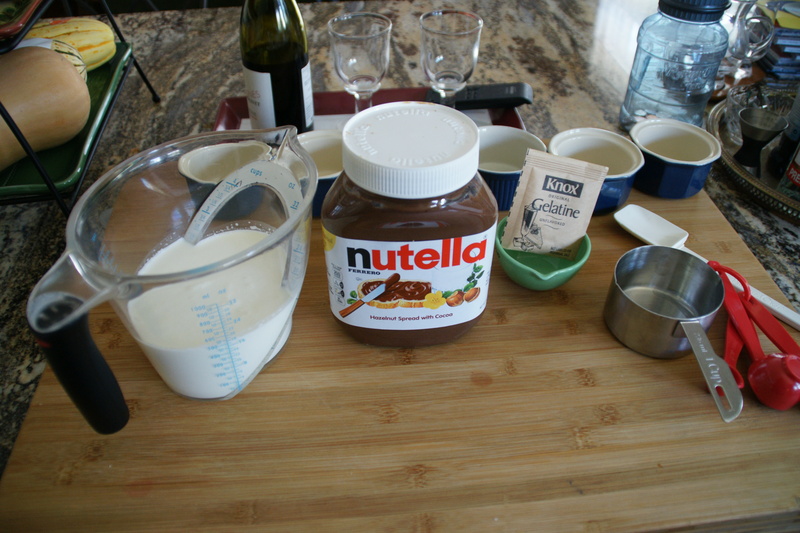 In the meantime, place the milk, cream and Nutella into a saucepan. One CUP of Nutella for six ramekins – you do the math! Heat over low heat, stirring as needed to melt the hazelnut spread into the liquid. You’ll end up with a lovely chocolate milk color! Maybe a new chocolate milk drink? When small bubbles begin to appear around the edges of the pan, remove the pan from heat. Do not let the liquid boil! Bubbles form around the rim and just start to rise to the surface. 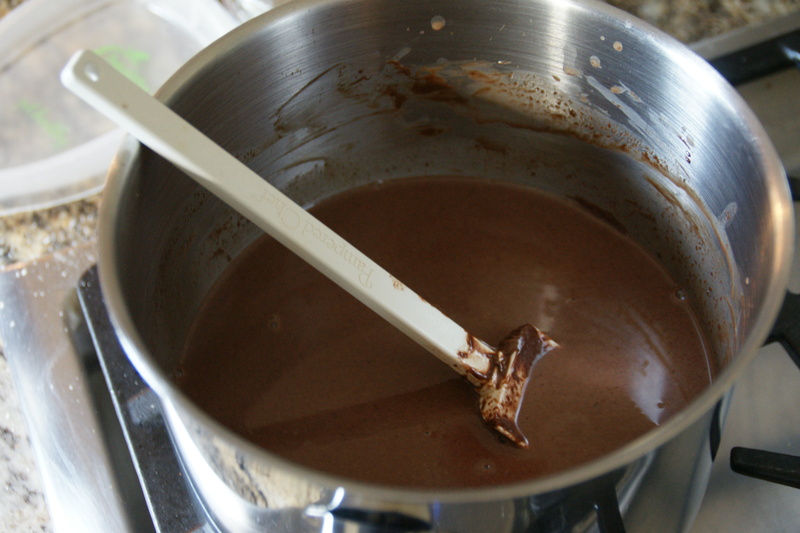 Test to make sure the gelatin has softened; if it’s ready, scrape it into the pot of chocolate milk and stir to dissolve. Pour 6 1/2-cup ramekins, then refrigerate the panna cotta until set, at least four hours to overnight. I pour from the pan into a measuring cup because it’s easier to use. When ready to serve, remove ramekins from the fridge. Dip each into a bowl of very hot water for about 30 seconds. Wipe the excess water from the ramekin’s surface and unmold onto a small plate. Use very hot tap water. Just like unmolding any gelatin dessert! For a jelled dessert, this one is pretty awesome! I left these, unmarked, in my fridge overnight, and in the morning, two were already gone! Early Halloween goblins? I am loving that you are back blogging and posting amazing recipes! I hope all is well! Andrea! We are truly simpatico– was just thinking about you the other day after seeing Staci’s FB posts about ACL. Thanks for staying connected through the blog– we need to catch up. Will PM you soon to hear about your latest adventures! Take care!